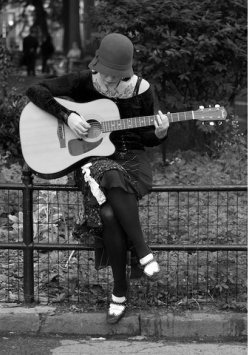 Some News: There will be a meeting of the Washington Square Park Task Force and Community Board 2 Parks Committee on Wednesday, May 6th focusing on the design of Washington Square Park‘s comfort stations (i.e., bathrooms) and administration buildings, all located on the South side of the Park. It’s true that a large percentage of park users and neighborhood residents wanted the bathrooms given priority (they’ve fallen into serious disrepair). However, that sentiment applied to moving the implementation of their reconstruction up in the Parks Department’s plan to Phase I (or even Phase II) of the project, not to leave this for last – which is what is happening. Wednesday, May 6th, 5:45 p.m., Meet at WSP Maintenance Office (south side of Park); Continues afterwards (approximately 6:30 p.m.) at Judson Memorial Church, Assembly Hall, 239 Thompson Street (off Washington Square South). Check out Community Board 2‘s new web site. 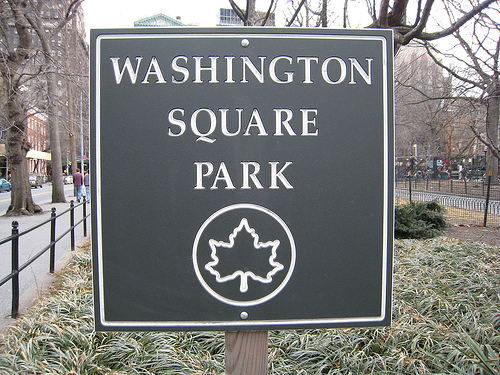 On Wednesday, February 4th at 6:30 PM, the Washington Square Park Task Force and Community Board 2 Parks Committee will meet to review Washington Square Park Redesign Phase 2 including plans for the stage, mounds, and sitting alcoves. Location: St. Vincent’s Hospital, 170 W. 12th St. Cronin Auditorium, 10th Floor. * The large playground (Northeast side) will be done in segments so that the whole playground is never closed at one time. It will remain in its footprint (same size) and will include a spray shower, new lightweight gate, spray area, spray features, a water trench, sand box, swing area, a children’s garden (outside the playground fence), floating benches, new trees (one cherry tree is slated for destruction), and “safety surface” (a sample of which will be provided at some point in the future). CB2 Chair and WSP Task Force co-chair Brad Hoylman added, to explain the isolated meeting, “There are no parents of young children on the Task Force.” (Its purpose was to outreach to the community. Then, he said, by way of clarification, there are parents but of older children.) Matt Davis, who directed the documentary “SQUARE: Straightening Out Washington Square Park,” then asked if there were any “dog owners” on the Task Force. This was not adequately addressed although it seems the answer is no, but that doesn’t mean the dog runs are getting their own meeting. * The Parks Department has assigned a designer to work on the playground (Chris Crowley) who is willing to work with the community, contrast this with the landscape designer working on the majority of the park (George Vellonakis) who isn’t. * And it was the first time I heard someone quote from the Landmarks Preservation Commission‘s ruling in a way that limited what was done. Apparently, the LPC “did not want McDonald’s in the playground” so there will be a limit to big, colorful, plastic fixtures, I gather. 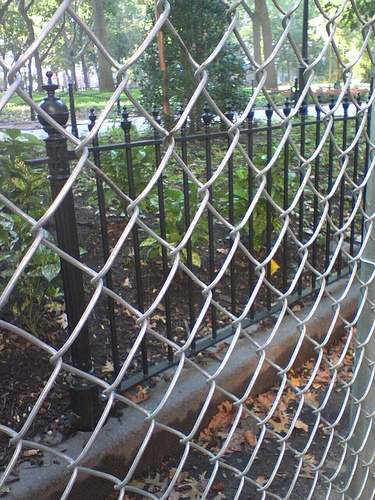 * Wouldn’t it be nice if … high, unwelcoming fences, misplaced lamps, overdone gardens, leveled off plazas, aligned (Tisch) fountains, massive reduction of public space, sterile pathways, suburban plazas, and a close-to-maniacal-emphasis-on-symmetry were off limits in their ruling also?